A regular feature of everyday life in Bangalore, and apparently much of the rest of India, is the power cuts. Since yesterday we’ve been having one thunderstorm after another, and somehow whenever there’s heavy rain we seem to get power outages to go with it. Most of last night the power was off, and it was still off when I got up this morning. Given that it’s Good Friday and I’ve got a day off work, it was a big relief when the microwave beeped back into life at 9am. Since then we’ve lost power about 4 or 5 times today, although each time for an hour or less. Apartment complexes, hotels and bigger houses all seem to have their own diesel back-up generator for these occasions, but my flat has a small UPS or Un-interruptible Power Supply. It’s basically a charger for a large lead-acid battery, similar to what you’d have in a car but much bigger. Under normal operation it keeps itself charged up from the mains. 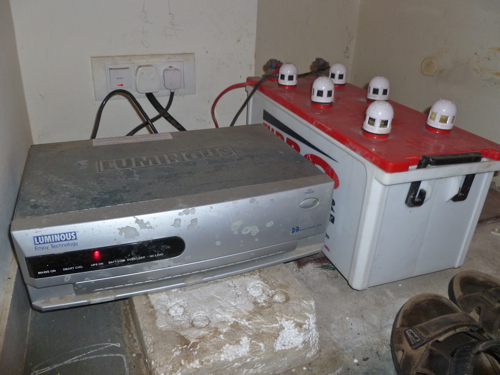 Once the mains fails, the UPS supplies the house, using an inverter circuit to create something like 240V a.c. from the 12V d.c. battery. This works OK in theory, but in the past I’ve found the battery only lasts about 2 hours, depending on what’s switched on. The big downside though is that it only supplies the low-ampage circuit in the house, which means that everything on the 32A circuit — air-conditioning, oven, microwave, fridge-freezer and kettle — stays off. Since I haven’t got round to working out how to get some bottled gas delivered yet, this means I can’t cook anything. Oh, the hot water geyser would be out of action as well — but I’ve never actually used that yet because I’ve got solar water heating. I was a kid during the times of the miners’ strikes and the 3-day week that happened in the UK in the early 70s, but I can still remember the power cuts and sitting around with candles listening to a battery-powered radio. It really makes you realise how much we take electricity for granted — and of course this was in the days before personal computers and ATMs and other things that are hard to do without. Here in a developing country like India, it’s also a reminder of how the infrastructure of rapidly-growing cities can struggle to keep up. During the decade 1991-2001 Bangalore’s population grew by an astonishing 61% to 5.7 million; according to the 2011 census which just happened this month, from 2001 to 2011 it rose another 47% to 9.5 million. So the population has more than doubled in the last 20 years. A power cut here also means there are no street lights, at least in my neighbourhood. I just went out to the local supermarket in the rain and it was pretty tricky navigating along the pavements, which are like an assault course at the best of times. With rivers of rainwater running all over the place, and plenty of puddles, potholes and broken, uncovered storm-drains all in total darkness or poorly-lit by passing traffic… it becomes quite a challenge!